Multiple Operations Mode smartpPID offer 3 different operations mode Monitor the smartpid report the current temperature and reference temperature for both channels interdependently. When temperature reach the target value an alarm is played, and a count up and count down timer is started Manual Mode same as monitor mode but you can manually regulate the fan speed in the range 0 – 100 % where 0 correspond to minimum speed , and 100% to maximum speed Auto mode this is the real working mode where the PID controller try to regulate smoothly the FAN speed from 0 to 100% inversely proportional to the error between set point and target temperature Lid Open mode the smartPID algorithm try to detect when you open the lid and so the pit temperature will drop drastically causing an increase of the fan speed. In order to avoid this the current temperature dorp detection move the system in lid mode status and reduce the fan speed for a certain amount of time configurable In the next release all the wifi connectivity and remote logging of the data will be added using same approach than homebrewing application. Also the smartphone app will be adapted to BBQ applications new features will come with the suggestion of pit master ! Beer and BBQ is a perfect marriage and smartPID is the killer application stay tuned ! This entry was posted in Blog and tagged barbecue, bbq, control, grill, pid, pit, pit master. Bookmark the permalink. 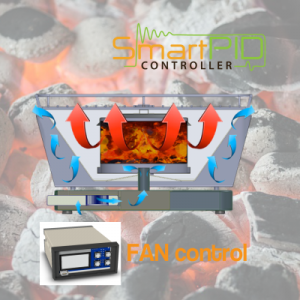 Is the SmartPID BBQ edition available? If not, when will it be available? What is the price and what is included? Does this have dual control for the bbq controller? The controller I currently use uses pit temp to control fan until meat reaches set temp and that probe then takes over controlling fan speed at whatever rate is needed to maintain meat temp. I am in new Zealand. Is shipping available to here? Also does it come as a complete. Set or as smartpid only. Can you change the software yourself?